The purified antibody is conjugated with Peridinin-chlorophyll-protein complex (PerCP) under optimum conditions. Our Abpromise guarantee covers the use of ab65951 in the following tested applications. 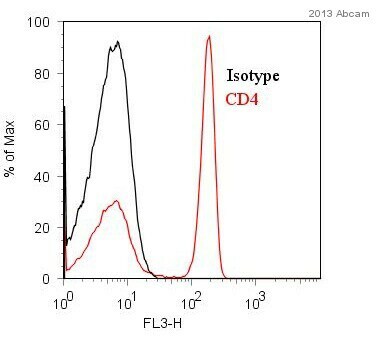 Flow cytometry analysis of Human whole blood after red blod cell lysis, staining CD4 with ab65951. Cells were fixed with paraformaldehyde. The sample was incubated with the primary antibody (1/100 in 1% BSA in PBS) for 1 hour at 4°C. 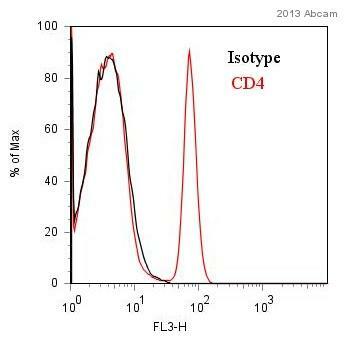 Flow cytometry analysis of Cynomolgus monkey whole blood after red blod cell lysis, staining CD4 with ab65951. Cells were fixed with paraformaldehyde. The sample was incubated with the primary antibody (1/100 in 1% BSA in PBS) for 1 hour at 4°C. Publishing research using ab65951? Please let us know so that we can cite the reference in this datasheet. 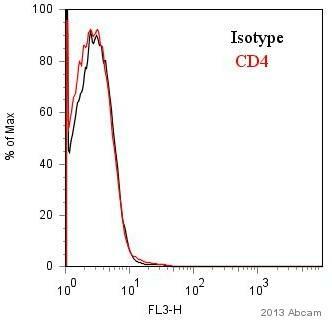 Does this CD4 antibody cross-react with human IgG1? The immunogen for this product is listed as "two N terminal domains of human CD4 fused to human IgG1 Fc." Thank you for contacting us. 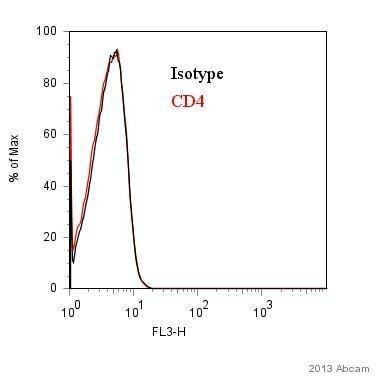 The lab has confirmed that this antibody is indeed specific to CD4. We will guarantee it not to react with any human IgG1 that may be present in your experiments. I hope this helps, please let me know if you need any additional information.